From being developed for the automotive industry to being posted on billboards as smart advertising, QR codes have gone mainstream. Considering the information stored QR codes exceeds barcodes by one whole dimension, QR codes are used to share links, passwords, and even confidential information like bitcoin public keys. There are plenty of online tools available on the internet which offer free service and convert your information into a QR code without downloading any software. This may be efficient but leaves your sensitive information at a risk. Offline apps ensure that your data is not shared over the internet. Here are the best offline QR code generators for Windows, macOS, Android, and iOS. Let’s begin. A Firefox Add-on shouldn’t be on the list of offline QR code generators. 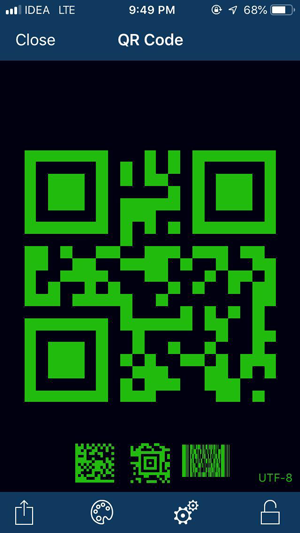 But this one works offline and you can use it to create a quick QR code of plain text and URLs. There are however a few options which let you adjust settings of the output matrix. For example – you can change the background and QR code color, adjust the size of the matrix, and select the image type. You can choose between a PNG or an SVG file type. The QR code would be saved to your computer and you can do it by right clicking the code and selecting ‘ Save QR code’. The offline QR Code generator is free and open source and it also works on Firefox for Android. 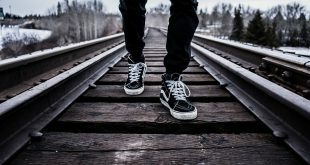 This Chrome extension is similar to the Firefox Extension but they’re made by different developers. 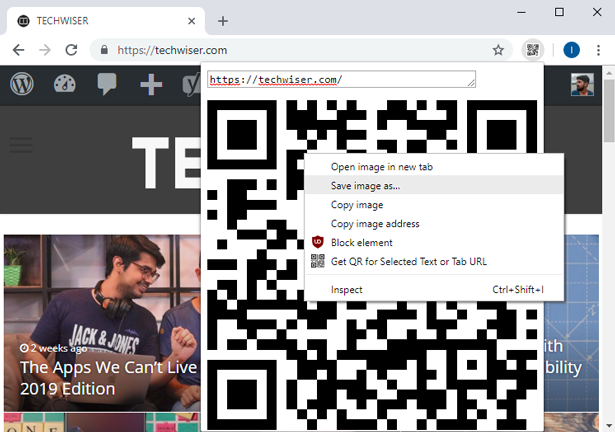 Offline QR-Code Generator lets you create a QR code within your browser. You can paste the text in the input field and it automatically generates the QR code which you can save to your computer. There are customization options but if you’re creating QR codes for texts, you won’t need them anyway. You can get this extension from the Chrome App Store. 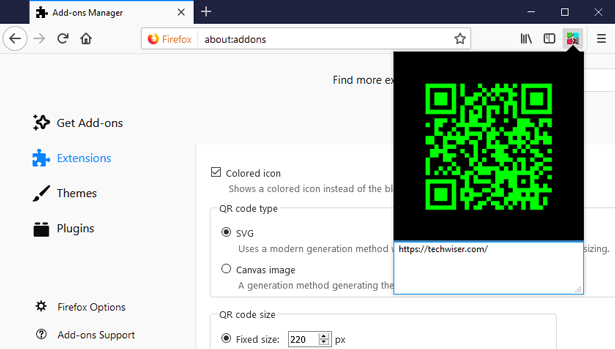 QR-Code Studio is a quick way to generate QR codes on Windows. Along with the UTF-8 character set, it also supports Latin, Chinese and Japanese Encoding and you can select any one while generating QR codes. There are a couple of customization options like you can adjust the size of the square matrix, resolution, quiet zones, and color. It supports standard error correction which ensures your QR code can be interpreted with a partial matrix. You can export the files as an image or copy to the clipboard and then share it with other people. 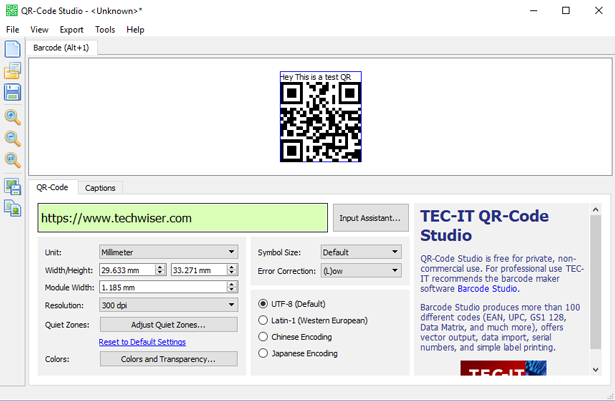 QR-Code Studio is free to use software intended for non-commercial purpose and you can purchase the commercial version, Barcode Studio which offers even more features. It is available for Windows and MacOS. Next, we have a tiny Java-based QR code generator which lets you generate QR codes for more than just plain text. With this portable software, you can generate a QR code for text, URL, Email, vCard, Wifi credentials, and even Wifi credentials. You can set it to automatically detect the best mode for the QR code. Unlike the previous app, you get QR code details like the number of characters, total bytes, and encoded bytes. The output QR code is generated in the next window and you can copy it to the clipboard. You don’t even need to install it on your system to run it, you can just carry it on a flash drive and use it as Plug and Play. 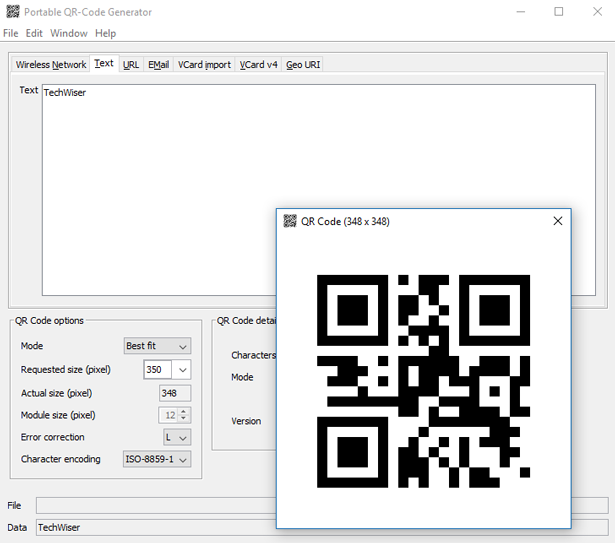 Portable QR-Code Generator is free and available for Windows, MacOS, and Linux. 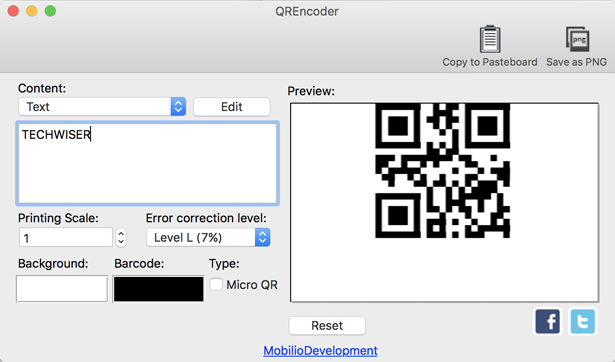 This next app is exclusive to macOS and lets you convert a wide variety of data into QR codes. It has a dedicated option to convert text, calendar events, Geolocation, URL, iTunes URL, YouTube links, and Twitter URL. You can change the color of the output QR code but I would recommend using a high contrast color pair to get better results. It also has an option of generating a micro QR code for compact use. As you type the contents in the input box, you get an instant result of the output QR code. You can copy the QR code to clipboard or save it as an image on your system. QREncoder is free and you can get it from the Mac App Store. The Play Store is filled with poorly designed apps which do work but are terrible to use. Barcode Scanner and Generator app is one of the few apps which provide a decent UI. Using it to create a QR code is fairly easy, you select a code type and then select what kind of information you are going to feed into the app. It generates a code which you can share or save to your phone. It lets you generate a QR code, Aztec code, PDF417, and all the standard barcodes. 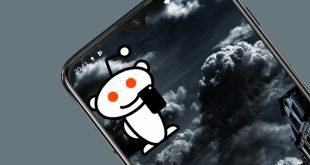 The app is free on the Play Store and has ads. Qrafter is a multi-purpose app which also acts as a QR code scanner. Even though iOS natively detects and decodes QR codes, this app can even decode barcodes with custom encoding. You can create QR codes for texts, URL, location, etc. When you generate a code, it shows a QR code, a data matrix, and a PDF417 barcode. It also supports barcode encoding and lets you create traditional barcodes as well. This app is ideal if you want to generate the QR code for sensitive data. Qrafter is free on the App Store and also offers a Pro pack for $2.99 which lets you generate bulk data of scans and mail it as a CSV file. These were my picks for best offline QR code generators. I would recommend portable QR Code Generator for Windows as it doesn’t require you to install any files on your system. QREncoder works great on Mac and offers options for WiFi, location, contacts, etc. Qrafter is best for iOS. Chrome and Firefox also have offline QR code generators which work well but are basic and offer only plain texts. Tell us which app do you like the most in the comments section below.